HONG KONG, Feb 14, 2019 - (ACN Newswire) - Generali Life (Hong Kong) Limited ("Generali Life") has launched a game-changing critical illness product, "LionGuardian" (the "Plan"), the first product in the market to offer whole life protection with unlimited(1) major critical illness benefits. The Plan also provides high levels of protection for benign tumours, congenital child illnesses and common mental health conditions. The debut of LionGuardian comes at a time when rates of critical illnesses like cancer, heart attack and stroke are on the rise, with an increasing risk of striking younger people. LionGuardian provides comprehensive coverage of 138 different illnesses offering 100% of the Sum Assured for each Major Critical Illness Claim without affecting other benefit payouts. The Plan is unique in the Hong Kong market and has set a new benchmark for other products. The LionGuardian Plan is a first-of-its-kind policy which offers unlimited(1) protection for major critical illnesses for health risks including cancer, stroke and heart attack with coverage of the insured up to 100 years of age. The protection is "unlimited"(1) in the sense that customers can file claims an unlimited number of times and the total amount of benefits paid will remain unlimited over the course of the insured's lifetime. Generali understands the concerns of policyholders about the impact of debilitating illnesses on their finances and believes that every claim of Major Critical Illness Benefit is equally important. Unlike existing products which often discount Major Critical Illness Benefits claims by the amount of previous claims made on early stage benefits, the amount of benefits for the insured under LionGuardian for major illnesses will not be affected by previous claims, and the benefit resulting from every claim of major critical illnesses will be equal to 100% of the sum assured. This advantage is possible through another design in which Early Stage or Minor Illnesses Benefits are under a standalone coverage provision that has no impact on Major Critical Illness Benefits and Death Benefits. 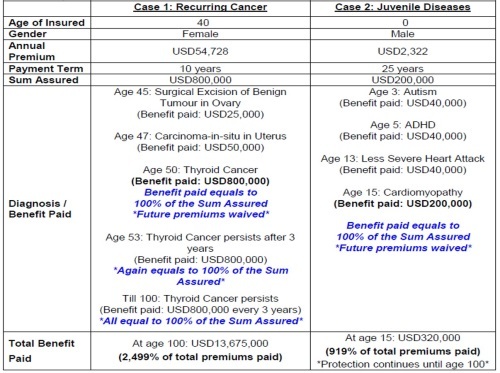 The benefit coverage is equal to 20% of the sum assured upon diagnosis. The Plan also waives payment of all future premiums after 100% of the sum assured is paid. - The information contained in this document is intended as a general summary of information for reference only. For details of coverage, please refer to the relevant insurance policy documents, e.g. illustration and product brochure (https://generali-prd.s3-ap-southeast-1.amazonaws.com/LionGuardian_TCEN_1.pdf) of LionGuardian. - For further details, please contact Generali Life (Hong Kong)'s Customer Service Hotline on +852 3187 6858. - This document is for distribution in Hong Kong only. It is not an offer to sell or solicitation to buy or provision of any insurance product outside Hong Kong.